In only three months the U.S. Middle East envoy, George Mitchell, has made two visits to Damascus, prompting world attention to the new place that Syria holds in the region. These visits should help determine the role that Syria will play in President Barack Obama's vision of peace for the Middle East. In 2003, Syria seemed to be on the brink of the abyss. A U.S.-led invasion of Iraq had turned the region upside down. Former President George W. Bush placed Syria on the list of states to be attacked. In Lebanon, the United States sponsored the anti-Syrian opposition in hopes of further isolating Syria. The death of Hafez al-Assad in 2000 and the ascension to power of a young leader, Bashar al Assad, made the situation even more fragile. In this difficult climate of isolation, war in Iraq, U.S. pressures and sanctions, Syria succeeded in making a remarkable transformation. The first step was made by bringing to power a generation of effective, Western-educated leaders who made remarkable ground in just a few years. Dr. Mohsen Bilal, an efficient minister of information, changed the media landscape of the country by offering an open-gates policy to private newspapers and media channels. Walid Al-Moallem, the foreign affairs minister of Syria, promoting a new image of his country, helped to pull Syria out of isolation. Dr. Faissal Meqdad, vice minister of foreign affairs, supported this active diplomacy, transforming Syria as a diplomatic Mecca in the last five years. His efforts were supported by professional diplomats like Walid Othman and the charismatic Mr. Saadala Agaa, minister of tourism, who boosted revenues by increasing tourism, which also helped establish Syria in the region. This new team, brought to power by President Bashar al-Assad, succeeded simultaneously in disengaging Syria from Lebanon, restoring diplomatic ties with Lebanon, sheltering 1.5 million refugees from Iraq (a humanitarian crisis of massive scale), growing economic development by 5 percent per year, closing the border to Iraq for terrorist groups and developing diplomacy in the region through the European Union. This mixture of diplomacy, open society and strong democracy made Syria a key for peace in the region. The assessment of Bashar al-Assad's first nine years in power is a positive one. Arab diplomatic wisdom says that there cannot be peace in the Middle East without Syria. Supporting Hezbollah in its resistance made Syria part of the reconstruction of Lebanon security and peace. When Hezbollah lost the Lebanese elections in May, Syria supported the peaceful recognition of the election results and the creation of a unity government. The Syrian diplomatic campaign for Golan was also a new success, with even the United States announcing that Israel must relinquish the Golan Heights to its rightful owner, Syria. The open relation with Turkey—accepting Turkey mediation with Israel and the warming relations with Iraq and the Gulf States—positioned Syria as the diplomatic rally point for France and Qatar diplomacy. 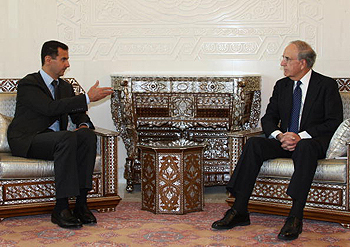 In 2008, Bashar al-Assad was invited for the July 14 celebration in France, an honor that few receive. The U.S. diplomatic overture to Syria is no doubt designed to exercise pressure on Israel. U.S.-Israel relations have been suffering since Obama's speech in Cairo. And until now, Israeli government chose to ignore the joint pressure from the United States, the European Union and Russia for a sincere dialogue with Palestine Authority and a halting of settlement expansion in territories occupied after the 1967 war. The U.S. decision to send a new ambassador to Damascus, along with European Union rapprochement with Syria, indicates that Israel cannot hope to indefinitely go against international community wishes. Mitchell now goes to Damascus with a solid agenda: peace talks, returning Golan Heights to Syria, Damascus aid in stabilizing Iraq and removing Syria from the U.S. blacklist. Washington is especially interested in having Syrian backing for a swift resolution of the Iraq conflict with a relinquishing of the U.S. troops stationed there. The United States is conscious that Iraq might go two ways—a Shiia Iranian Islamic revolution model, or descending into anarchy—and is trying to support a third way: a Syrian model of open society, secular state and political equilibrium that will also satisfy Kurdish autonomy and Sunni worries over a Shia-controlled Iraq. This Syrian model in Iraq depends on Damascus support and is a valuable asset in U.S.- Syria negotiation. The question is now whether the U.S. has embarked only on a charmed offensive to worry Israel, or if Mitchell found on the road to Damascus the light of a new policy for the region.